I've been experimenting with a new army type lately: Foot Eldar. Despite the propensity lately to "mech up" armies this one army type keeps showing up at tournaments and doing quite well. I'm not sure if Foot Eldar are a "tier 1" type of list, but they are certainly competitive and my explorations of this army type have yeilded good results and educated me greatly on how the army works. Reece's list has the standard core of an Avatar, Eldrad or Farseer, Harlequins and then double wraithlord and triple warwalker. His troop choices appear scattered to me but you have some defensive abilities with the scouts, guardian support, and mobility with jetbikes. As we'll see almost all footdar decide to use the Avatar to enjoy the benefit of fearless troops. As the troops are no longer protected with Wave Serpents, the emboldened infantry are necessary to hold those objectives. While not recent, I thought Blackmoor's footdar was an interesting place to continue analysis. His list is a higher point value and therefore has a bit more flexibility. His take makes some notable changes though. Blackmoor mixes together a solid sprinkling of long range str 8 and str 6 suppression fire. One notable difference is the lack or Wraithlords altogether. He migrates the str 8 shots to the guardian units instead. He then moves the str 6 shooting to the warwalker units. His lone falcon can transport his fire dragons and now he has the benefit of melta shots. Blackmoor has a more homogenized troop selection with guardian spam in lieu of scouts or dire avengers. He does retain the lone mobile bike unit. Toby's list seems to combine some elements of both Blackmoor's and Reecius. Toby uses the troop assortment that Reecius had along with a Wave Serpent for some mobility. He runs Wraithlords for long range fire support though and doesn't bother with the fire dragon / falcon combo. 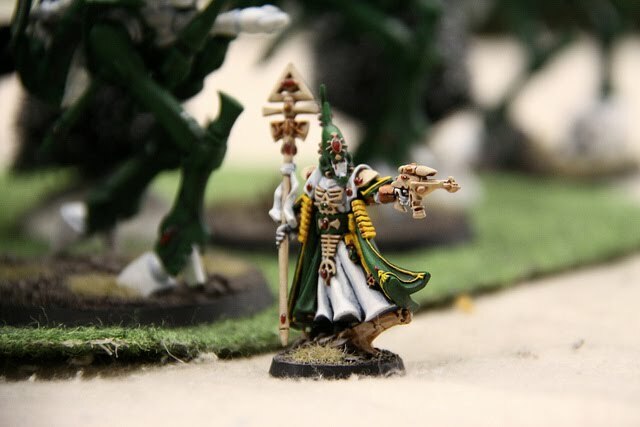 He relies on Warp Spiders for some back line mobile support and has very little str 6 shooting spam. Notable in these lists are the point progressions in them. We're comparing 3 similar lists but they are all at different point levels. I've decided to forego vehicles entirely to deny my opponent any use out of anti vehicle shooting, especially under the str 8 variety. The Wraithlords can be str 8 bait but with proper use we can give them a cover save and hopefully up their survivability. Str 6 spam is a staple of proper eldar, and footdar in particular and we have loads of that here. Guardians all possess scatter lasers and the war walkers provide solid shoot down support from reserve if we're afraid they won't last very long. I like Warp Spiders in these lists as it offers the ability to get to a remote location quickly and they can also stick around to even take out the occasional str 10 rear vehicle or just unload on some troops in the backfield. 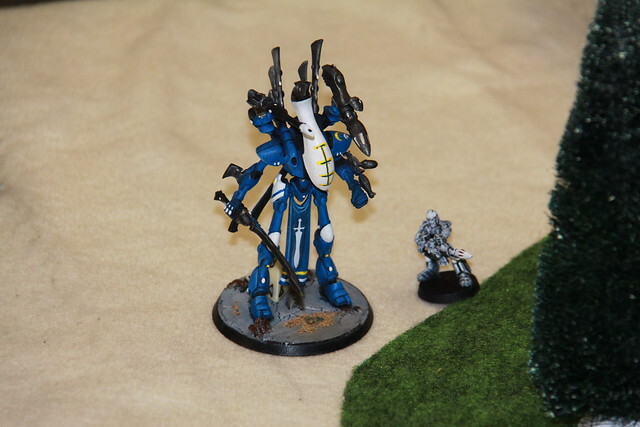 Harlequins boast a Shadowseer to keep the Wraithlords compliant. Between him and Eldrad you shouldn't have any issues with Wraithsight. This list has been a work in progress for me. The troops have changed numerous times and I'm trying to find the right combination of troops and types without over-committing. I like the bikes for their mobility but they really don't last very long under any kind of pressure. I think more than one is far too many. But a singleton unit necessary for that occasional objective grab. In kill points they are just a liability but hopefully their shuriken cannon can take something with them. Triple guardian might seem heavy but I like them with an Avatar keeping them fearless and they are shootier than avengers and really almost as resilient as scouts. Their weapon platform puts them over the top. My test games have gone well so far. It shows surprising resilience from range and then has some great mid range shooting and powerful counter assault elements. The biggest challenge is getting around the lack of mobility. I think I've put together a list that does just enough to overcome that. 3 Response to "Playing: Exploring Footdar"
I like the lists of "footdar". It'll be nice to see figures on the board instead of all mech. Im a fan of the soldier armies. They usually look cooler. I must say Footdar is one of the funnest armies to play, but you're right, their lack of mobility can be a challenge. Your list does counter that as effectively as Footdar can with Spiders, outflanking Walkers and the small Jetbike squad. It's truly an army that gets better with practice. Deployment, movement, and casting the correct psychic powers is crucial. Let us know how it develops.